"How will we get by this month?" Heard any of these concerns lately? Spoken them out yourself? Our lives are a continual turning of one challenge to another, and as much as we'd like to tick our pressures off a to-do list and toss the completed list in the trash, it rarely works out that way. Over the past year my email inbox has become increasingly filled with offers and questions. Most of the questions are from readers who ask 'how to do this' or 'what do you use for that' type of questions. The questions have been answered here on the blog many times and two have their own linked buttons in my sidebar for easy reference, so I can easily give the reader a link to follow and let them uncover the answers they need. No stress. But the offers of opportunity? That's completely different. I'm a quiet, dare I say "hermit" type person, who spends most of her life at home. I rarely go out, enjoy being alone, but also love spending relaxed time with my husband, daughter, and two close friends who live nearby. I like my world to be steady, fairly predictable, and to flow at a comfortable pace. This need to be calm, the desire to feel I've got things under control and manageable, is tripped up when invitations and opportunities are placed before me. I have OCD, and though one part of my mind can see benefits in certain offers made, the other part of my brain spins into a panic because I can't see what the outcome will be. I know I cannot trust my own wisdom because I'd choose to do nothing, go nowhere, follow the safe route in my mind - but God created me with a bigger picture than hiding my life away. The thing with God is that He works with us where we are, right now, in our current circumstances. I still marvel that He gifted me with the ability to design at age 50 and did it within my home environment where I am most relaxed and confident. He pushes me, yes indeed, but it's gentle, a hand behind lovingly urging me to trust him and move forward to the next stage. When I walk in His way I rarely stumble, when I walk in mine I often do. and I can safely trust Him to guide and carry me should the need arise. It's a habit to practice and path to follow without distraction (distractions which come in the form of self doubt and taking your eyes off God's truth) but the more you practice the more natural it becomes. 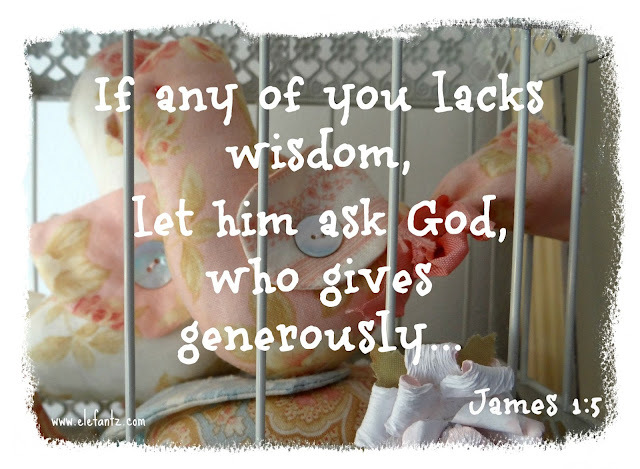 So often I forget to ask for wisdom and flounder around not knowing what to do. I need to learn to ask and then wait. Action is not always demanded immediately! Your posts are always encouraging and thought provoking. Thanks. I always enjoy your reflective posts. So glad your faith gives you this comfort. Such a good reminder! Thanks for sharing. Wonderful post today, Jenny. God's wisdom is so much better for me than my own! I love that scripture. It changed the world for a young boy who then turned around and changed the world for everyone. There are many things in James, often overlooked, which are filled with thought-provoking ideas, and a great understanding of Heavenly Father's children. Thanks for choosing this one today. I've been following your blog for two or three years now and each time I read your Sunday post, I am more and more sure that God led me here. I live a very secluded life...don't leave my house unless I absolutely have to and have panic attacks around large groups of people. God and prayer is my only comfort. Your words are always steeped in God wisdom and I know whatever you have to say is going to be practical to my life. Thanks so much for these words today. I needed them.